Below are just a few few things to look for while running through the city of good neighbors. Start: New Era Cap Global Headquarters. Formerly a Federal Reserve Bank branch, renovations began in 2006 to house the new world headquarters for New Era Cap. Inside, bank vaults are still fully intact; and New Era’s influence continues to grow globally as the only brand in sports to have exclusive on-field, sideline and on-court headwear rights for all three major sports leagues simultaneously: the NFL, NBA and MLB. 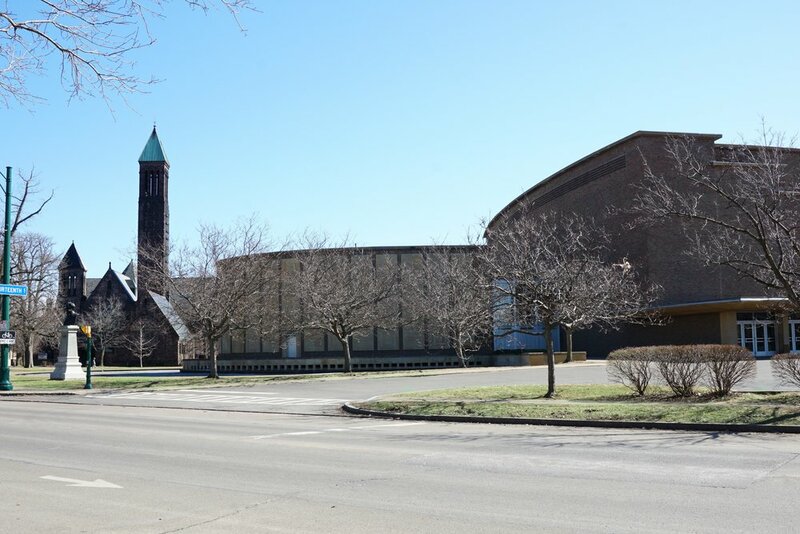 This Gothic Revival-style church was slated for demolition until Buffalo-born musician Ani DiFranco took on the massive $10 million renovation project in 1995. Today it’s a stunning multi-use arts hub housing Asbury Hall, a 1,200 capacity performance and event space; Hallwells Contemporary Art Center; and a subterranean bar. Launched as the less conservative alternative to the Buffalo Club in 1885, the Saturn Club was originally a men’s club devoted to card-playing and drinking, but stands today as one of Buffalo’s premier private social clubs for men and women both. The Tudor Revival style building, built in 1922, is a labyrinth of beautifully appointed rooms that includes a formal dining hall, dining room, library, bowling alley and beautiful enclosed courtyard. Originally called the Delaware Park Casino, then renamed for the city councilman who saved the building, the Marcy Casino was built by famed architect E.B. Green in 1901, timed for the Pan-American Exposition. The building has undergone significant renovations in recent years and now houses a restaurant on the upper floor, with weddings and special events taking place regularly on the first floor. In 1868, visionary landscape architect Frederick Law Olmsted came up with a concept that was the first of its kind in the nation: a series of six municipal parks connected by parkways and circles, connecting the city from the north, south, east and west. 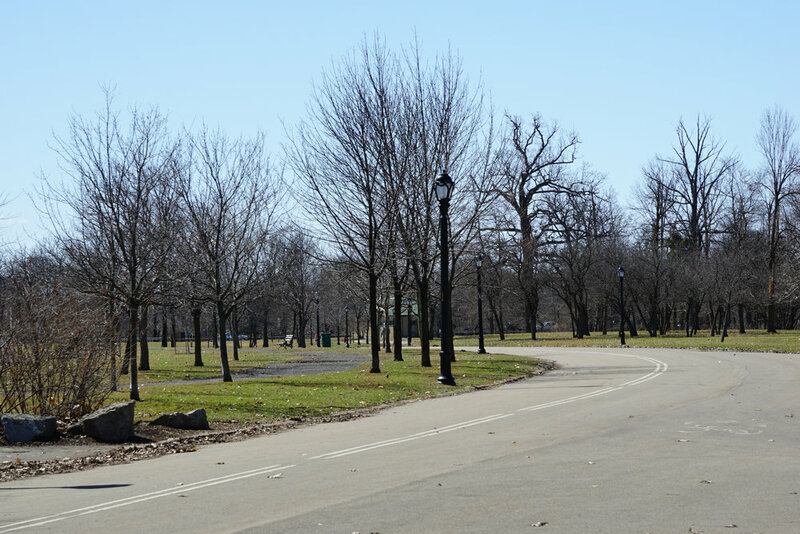 The development of major urban roads and highways mid-century diminished Olmsted’s original vision, but the parks are undergoing concerted preservation and restoration efforts today through the oversight of the Buffalo Olmsted Parks conservancy. Designed in 1894 by E.B. Green, 595 Delaware Avenue is the site of Buffalo’s oldest women’s club (and one of the nation’s first) which is still in operation today. The building is listed on the National Register of Historic Places. This area of Buffalo’s lower West Side is coming back to life as the city’s Hispanic Heritage District, with beautiful public art murals and newly forged steel fabricated signs welcoming visitors to the neighborhood. Look for a major mural at the corner of Niagara and Jersey streets, and micro murals along Niagara Street. Completed in 1927, the Peace Bridge remains one of the busiest and most commercially relevant border crossings in North America, connecting Buffalo to Fort Erie, Canada. Nearby Front Park is part of Frederick Law Olmsted’s original parkway system conceived in the late 1800s. Protected by a long breakwall, Erie Basin Marina is one of Buffalo’s most popular recreational boating launch sites. The large public area includes a garden; multiple restaurants; and an observation tower. Legend has it that the marina is designed in the shape of a Buffalo when observed from above. Home to former war ships the USS Little Rock and the USS The Sullivans, visitors can tour the ships and discover memorials and exhibits throughout the waterfront park. Key Bank Center is Buffalo’s largest indoor arena, seating more than 19,000 fans. It opened in 1996, becoming the new home of the Buffalo Sabres and replacing the former Buffalo Memorial Auditorium. The arena also hosts the Buffalo Bandits lacrosse and major concerts and events throughout the year. The brutalist-style Buffalo News building was designed by Edward Durell Stone, the architect who also designed the Museum of Modern Art in New York City and the Kennedy Center in Washington, D.C. It stands as a piece of architectural history and as the ongoing home to Buffalo’s sole remaining daily newspaper. 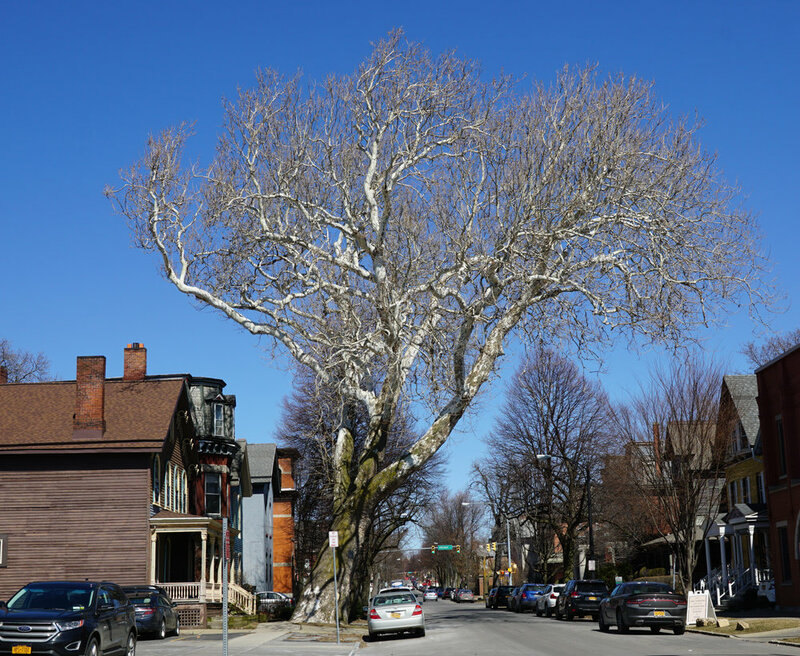 On Franklin Street, just north of Edward, stands Buffalo’s oldest tree. A plaque commemorating its longevity states the tree was planted in 1690, which puts its age at 320+ years. 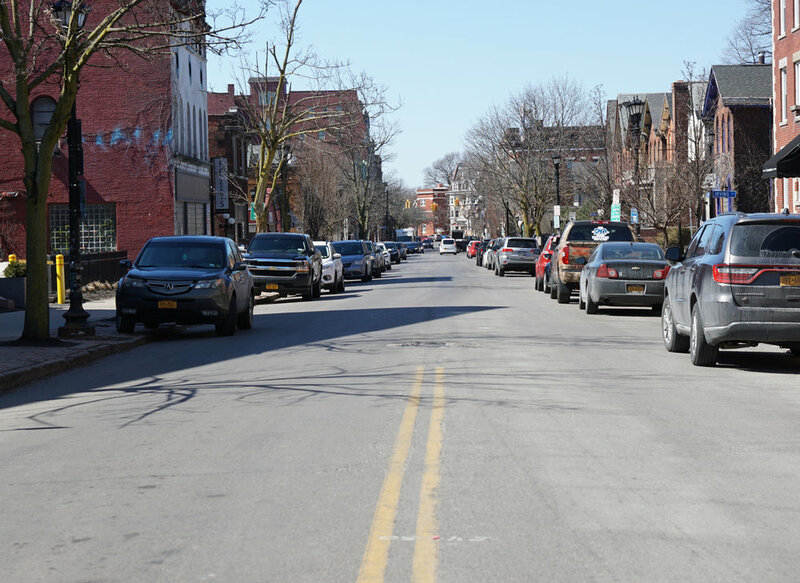 Characterized by noteworthy historical brick and Victorian homes intermixed with a walkable, concentrated collection of restaurants, bars and retailers, Allentown is one of Buffalo’s oldest and most distinct urban neighborhoods. 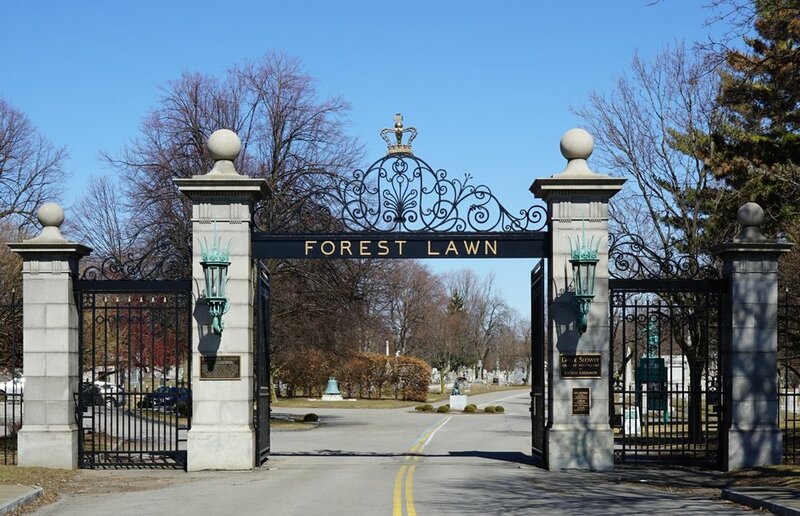 Beautifully pastoral Forest Lawn was founded in 1849 and covers 269 acres of land in central Buffalo. It’s the final home to former president Millard Fillmore, Dr. Roswell Park and Rick James, among many other notable Buffalonians. Its stunning sculptures, memorials and mausoleums and natural beauty make it a popular destination for runners, bikers and organized tours. The centerpiece and largest of Fredrick Law Olmsted’s original parkway system, Delaware Park provides an urban escape to its North Buffalo neighborhood with a golf course, tennis courts, Hoyt Lake, rose gardens and plenty of trees and open space. 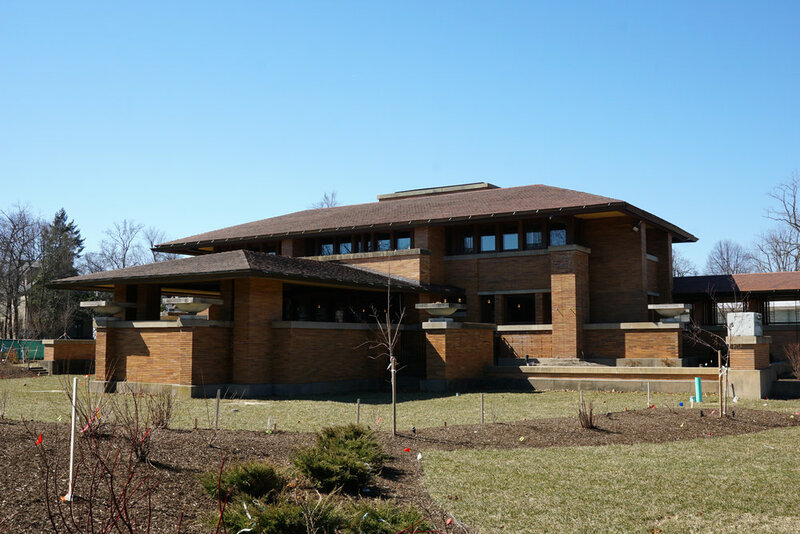 Considered one of architect Frank Lloyd Wright’s most important achievements, the Darwin Martin House has become one of Buffalo’s top cultural destinations in recent years, welcoming upwards of 40,000 visitors per year. 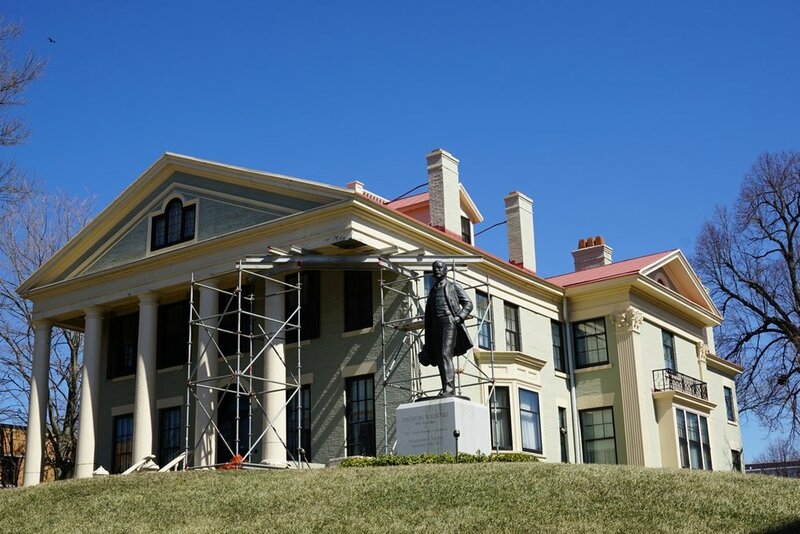 The six-building complex has undergone an extensive restoration with a major landscape project still underway at the National Historic site. At 1669 Hertel Avenue – near the corner of Wallace - look for an inspirational quote by Buffalo’s favorite adopted artist, Gord Downie of the Tragically Hip, whose untimely passing in 2017 still has fans mourning. The country’s third oldest zoo, established in 1875, was originally conceived as a deer park to complement Frederick Law Olmsted’s vision of Delaware Park. It quickly grew and expanded, undergoing multiple renovations including a major Works Progress Administration project in the late 1930s/early ‘40s that integrated classic period architecture. Most recently, the zoo added the popular rainforest and Artic Edge exhibits, and a new zoo entrance was unveiled in 2013. With more than 100,000 artifacts and 200,000 photographs chronicling the history of Western New York, the Buffalo History Museum’s exhibits range from sports history to Buffalo’s involvement in WWI to our region’s native American history. The current building was designed and constructed for the Pan-Am Exposition in 1901. The Albright-Knox gallery campus features two distinct buildings by renowned American architects: one neoclassical, designed by E.B. Green (1905), and a modern addition envisioned by Gordon Bunshaft (1962). With an internationally respected collection of modern art, the gallery will undergo an additional 25,000 square-foot expansion in the coming years. 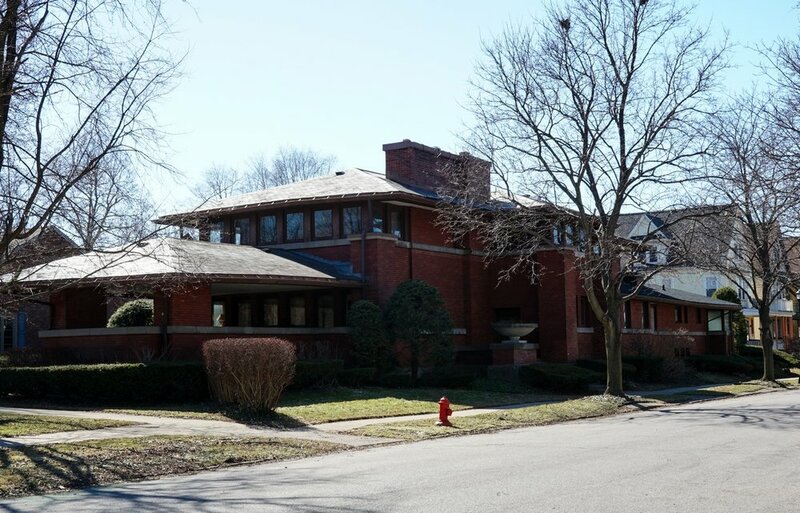 Tucked into the residential neighborhood near Elmwood Avenue is another of Frank Lloyd Wright’s architectural masterpieces, the William Heath House. Located at 76 Soldiers Place, it’s smaller but similar to the Darwin Martin House in its prairie style design. Yet another significant architectural gem sits at Symphony Circle: Kleinhans Music Hall. Opened in 1940 and distinctly designed by Eliel and Eero Saarinen, it is also considered one of the most acoustically perfect halls in the world. When President McKinley was assassinated at the Pan-Am Exposition, time was of the essence to swear the new president into office. The inauguration of Theodore Roosevelt was quickly carried out at the home of Roosevelt’s good friend, Ansley Wilcox. The room in which he took the oath of office has since been restored to its original state, and the attached museum, opened in 2009, shares the context of the times. The 96-foot tall McKinley Monument is an obelisk-shaped structure in the center of Niagara Square, facing City Hall, erected to honor President William McKinley who was shot and killed while attending the Pan-Am Exposition in Buffalo in 1901. One of the largest (and costliest) municipal buildings ever built in the United States, Buffalo City Hall opened its doors in 1931. Murals, sculptures and beautiful architectural detail can be found throughout the building, and visitors can discover breathtaking views of Buffalo from the observation deck 28 floors up. The Art Deco masterpiece is listed on the National Register of Historic Places.